The backstory: In 2013 Roscoe Mitchell recorded Conversations, a trio album in two volumes, with pianist Craig Taborn and drummer Kikanju Baku. Next, Mitchell and his former students Christopher Luna-Mega and Daniel Steffey transcribed and orchestrated that album’s free improvisations for a 19-piece ensemble. The band contained players from Montreal and Toronto, chosen for their ability to read and improvise. They rehearsed Mitchell’s difficult music for a week, gave a concert in Montreal and one in Toronto, then went into a Toronto studio and made this album. Transcribing and orchestrating jazz solos for big bands is not a revolutionary idea—unless the transcriber is working with content that lacks guideposts of tonality, harmony and meter. In his useful liner notes, Stuart Broomer says this project is “unlike anything you might have heard before.” He’s right. Incongruous chords lurch across sections of the orchestra. When you think the music is looming into motion, it falls silent. The dense ensemble heaves, expands and contracts. Limitless factors are in play: strident blends; eruptions of dark drums; bright flashes of piano; sudden full orchestra crescendos that don’t last. The music is a series of seemingly autonomous sonic events. Form is perceptible only after the fact. The frequency range is enormous, from bass saxophone to piccolo. Evolving sonorities sometimes find startling beauty. The unstable ensemble is an exciting, challenging setting for improvising soloists. On “They Rode for Them, Part One,” Yves Charuest’s alto saxophone, floating free over the shifting sands of the orchestra, is suspenseful and mesmerizing. Mitchell’s only appearance comes on “Part Two” of that piece. His sopranino solo is the kind of wild, shrieking outpouring that used to sound outrageous. In the context of this groundbreaking album, it feels reassuring: the devil we know, as opposed to the devil we don’t called Ride the Wind. 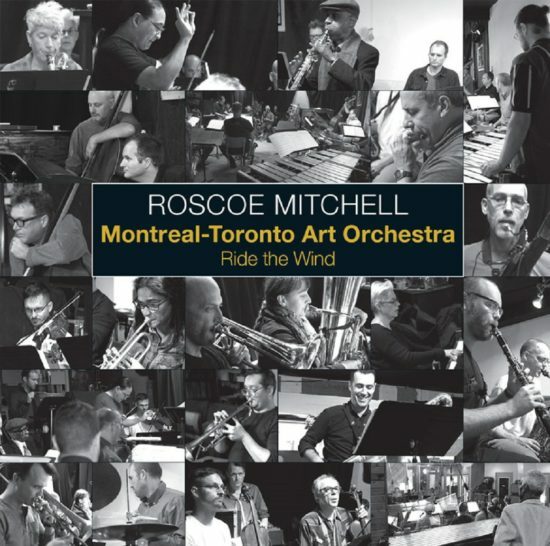 Preview, buy or download Ride the Wind by Roscoe Mitchell & Montreal-Toronto Art Orchestra on Amazon.